Thank God It’s Saturday! A New Blog from Marist Brothers! Imagine watching the first Jurassic Park movie without knowing that eventually the dinosaurs are going to break loose and start eating people. Can you picture the lush vegetation and beautiful terrain? Maybe if you focus hard enough, you can catch a whiff of fresh air…it’s easier to appreciate these things when you don’t have a hungry T-Rex chasing you. They’re always hungry. I’ve been in the Dominican Republic for a month and a half now, working as an intern for BLUE Missions as I complete my degree in Sustainable International Development from the Heller School at Brandeis University, and lately I’ve been thinking about Jurassic Park. I’m not a fan of the movie—I never saw the sequels or read any of the books—but how else can I describe the beauty I see in the Dominican countryside? 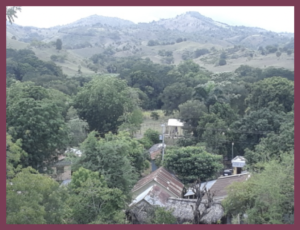 Dominicans take pride in the natural beauty of their beloved country, but danger lurks among the forests and mountains. Figures from 2015 show about 18% of the rural population here in the DR lacking convenient access to safe drinking water, with about 24% lacking access to safe and hygienic sanitation facilities. Life finds a way of being difficult for everybody at one time or another, but for most readers of this blog, the struggle to survive doesn’t include the risk of water-borne diseases or the time and labor involved in daily fetching water from a source 40 minutes away. I have personally only had to risk drinking potentially unsafe water once in my life, and it was through my own fault—I hadn’t prepared for a hike I took by myself in France, because I hadn’t planned on getting lost in the woods. I should have known better, but I’m fine. Those very same Dominican landscapes offer hope and salvation as well though. A number of my hikes here have been with colleagues to evaluate potential new water sources to supply a community’s future aqueduct system. Yes, there is a water crisis, but there are also untapped water opportunities. People are tough. We find a way to live. The intermingling of beauty and danger in my tropical surroundings is similar to the rest of life in our broken, messed up world. The people and institutions that should provide the most reliable safety and comfort inevitably find ways to hurt us, whether by accident or through criminal behavior. Monstrous crimes were committed within the Church and other trusted institutions both by abusers and those who covered up abuse. While some of us were victimized directly, others of us suffer from a sense of both collective and personal betrayal. But we are strong, and we can both stand with those who don’t feel strong at the moment and also strengthen our Church by demanding justice and accountability. Life will find a way. At the same time, I remember another unnatural disaster unleashed at Mother Emanuel Church in Charleston, SC in 2015, when a white visitor sat as a welcomed guest with a black prayer group before opening fire on them, murdering nine. The shooter failed in his attempt to spark a race war, and instead the pained response of surviving parishioners and family members was forgiveness, mercy, and love. Because life finds a way. Today is a special, but often overlooked holiday in the Catholic Church. In remembering the birth of Mary, Mother of Jesus, we remember the birth of an ordinary woman whose bold decision to say ‘yes’ to God’s will allowed for transforming and redemptive grace to enter this world. This is also a special day for me personally, as it marks the day, ten years ago now, when I officially began my life in the Marist Brothers community as a postulant. There have been unexpected pains and sorrows along the way, as there is over the course of any life. The biggest and most numerous of surprises however, have been joyful ones. As many of my friends, colleagues, and former students begin a new school year, we know that in this too there will be both challenges and joys, but never fear: life finds a way. By the way, I know that in Jurassic Park, the phrase “life finds a way” foreshadows the dinosaurs breaking loose and running amok, but all the characters we really like survived, right? Life finds a way.